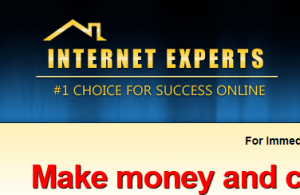 Is Internet Experts a Scam? I Really Wasn’t Happy With it. Name: Internet Experts by Karen Johnson. Price: $97, down sold to $67 if you click the back button enough times (that’s the lowest I could get it down to). Very giant likelihood of more up-sells if you purchase this program. Overall Rating: 2 out of 10 stars. This is simply a reduplicated program that was once sold, and either did bad in sales, or scammed people so much that they got smart to it, and so the people who made it changed it’s name to Internet Experts in order to keep driving sales. This program could have been called one or more names before, but it doesn’t matter, it’s still not good. This is a program that was duplicated off another, low quality program I reviewed in the past. They just took it, renamed it and made it seem like it’s new. It’s not and it’s not good either in my opinion. I regularly find programs like this and even though this particular one had numerous signs it was a scam (I’ll explain them), I always attempt to purchase it anyway in order to give it a fair review. It’s just the fair way of operating. But looking through my list of programs I’ve reviewed, the name Internet Experts doesn’t come up, yet they say I have it. There exist very bad programs out there in the online world that many of us call “get rich quick schemes” which are also commonly shiny objects in the MMO world. What they do is they pitch a get rich quick scheme to people, make a sale, but because they don’t give what they promised (an easy approach to making money), people start to think of them as scams (and correctly so). So what ends up happening is that once the complaints pile up and people start spreading the word about the said program being bad, they simply change the name and re-market it all over again under the different name. But whatever was inside the program stays the same as it was before (and if it was bad before, it’ll be bad again). This is just done to keep driving sales. -Let’s say someone makes a program called Make Money Program A. The program makes sales, but also gets a lot of complaints because it’s generally bad. -To protect it’s reputation, the same someone scraps the name, and make a new name: Make Money Program B and just keeps selling the same program, but under a different name. -That’s ALL you need to know about IE, because that’s what’s going on here. Some people in the online world call this bait and switch, others just call it a scam. Either way, it’s deceptive, it’s bad and it’s not something I’d recommend. If it was good, I’d be recommending it. But I’ve seen this operation run on numerous programs before and they were always bad. Now I don’t know if IE was connected to 1 previous program or several, and I honestly can’t remember which one it was, but I’m telling you guys, I remember the good ones, because there are VERY few of them and if this was good, I’d know it, and I’d recommend it. However, this is NOT the case here. 2) If it was really a good program, why change names? 3) Karen Johnson is just another fake name. These programs almost NEVER tell you whose behind it. They usually make up a name like this and pitch it as a stay at home mom who needed to find work, blah blah blah, all that heartfelt nonsense to get you to believe them. It’s just not the actual person. 4) The pitch the whole get rich quick scheme approach. Guys, I am actually an expert at making money online and I can tell you that it’s not simple. It may not be the answer you want to hear, but it’s the truth and at the same time though, you CAN make money in this business (this is the best program I recommend), but you need someone to show you how to do it legitimately, not promise you a fake promise. And that’s just what get rich quick schemes are: Fake promises. If you see this or any other program pitch money making as something that’s easy, run, run the other way. 5) They deceptively utilize marketing words like “As seen on”, work at home special reports and other tactics. These are all NOT associated with the program. The sales page shows you how work at home programs are seen on TV, but the report itself has NOTHING to do with Internet Experts. The “As seen on” logos are just used to make you think it’s legit, when it’s not. These are NOT associated together, but they want you think they are. Do not fall for this! 2 out of 10 stars. The only reason I gave this a few stars is because they actually didn’t let me purchase it again. That’s at least something honest about this program, but it doesn’t change that it’s duplicated and renamed from another, low quality program I already reviewed and didn’t like. Throughout this review, I have said that there is a better option to make REAL money online. It is called Wealthy Affiliate and I have to say, before I found it, I was running into bad programs like IE over and over. 2) There’s real people behind WA you can SPEAK to (Including me. Get details here). Internet Experts uses fake personas. 3) WA tells you the truth: That you can make money online, but it isn’t easy and they’ll show you how. Internet Experts is lying to in getting you to think it’s easy. 4) I’ve made REAL income from WA (so have many of it’s 1 million+ members). Tactics used by Internet Experts indicate that they aren’t good. 5) WA has been around for over 10 years and has a great reputation. Internet Experts is just one of the many come and go, bad programs out there you can’t really count on. I’m very glad I didn’t have to waste any more money on Internet Experts and that at least they were honest enough to stop me from buying their reduplicated program, twice. But that doesn’t mean I can give it a recommendation. You already know what I recommended instead and I know you’re going to like that alternative way more. Then they could have sold you the program a second time. Don’t get me wrong, I am happy for you that you didn’t get charged for that, but do you really think it was due to honesty?! The feeling I get from all your reviews is basically to avoid any program that stipulates the word “rich” and “fast”! Thank you for the picture tip, that image will remain in my mind now! Thanks for the great work! Actually the fact that they didn’t let me get it twice is the only reason I didn’t go one level further with this review and say it’s a total scam and to stay away because that would be the next worst thing they could have done and believe me, I’ve had instances where such things have happened and it infuriated me further while writing the review. Great article, it always amazes me that people can promote these scams and then sleep well at night. You are doing a great service to everyone, but especially those new to internet marketing. Everyone who’s been in the business for a while has seen scams like this one and has probably fallen for it a time or two. But showing a new person what to watch out for can make the difference between them failing and succeeding. BTW, I also agree with your recommendation of Wealthy Affiliate, It’s a great platform for anyone interested in internet marketing. Keep up the good work! Thanks David. In my case, I fell for these scams more than 2 times. Had there been someone back then who told me what I know now about this industry and where to really go, I would have made it far sooner.